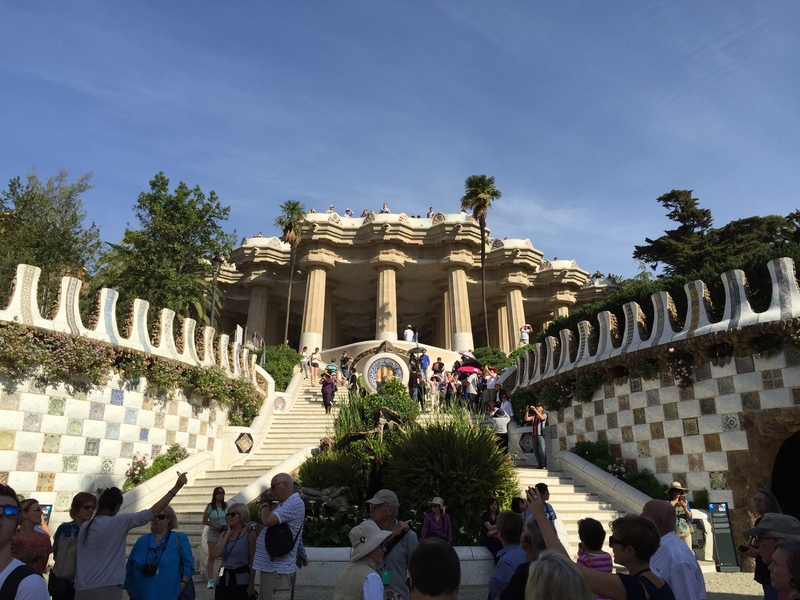 After a fantastic couple of days at the Spanish Grand Prix, on our final day in Barcelona we got up early and took the Metro to Parc Güell, where Gaudí had a dabble at landscape gardening. After taking escalators up a San Francisco style stupidly steep hill (with yet more stunning views) and initially getting lost at the entrance to the park, we made our way to the Monumental zone – the main part we had tickets for. The park was more impressive than I had imagined. It is perhaps the only place in the world where the surreal and man-made take on such a ubiquitous organicity that the natural forms seem unnatural and out of place. We went inside Casa Del Guarda, the porter’s house first before ascending the famous Monumental Flight of Steps, a double flight in sections that led past the famous brightly coloured salamander. At the top we came to the Hypostyle Room, a forest of 86 striated Doric columns which did not all stand straight as you would expect a column to. Instead, several leant at wide angles adding to the feeling of the manmade being more natural than the natural, perhaps even more so than in Sagrada Familia. Past Gaudí’s house we found Nature Square and the Teatre Grec on the roof overlooking the garden and offering perhaps the most splendid view of Barcelona yet. I loved the undulating bench that ran around the edge, which was planned by Josep Maria Jujol and made from prefabricated blocks of concrete clad with tile-shard mosaic and cylindrical pieces of pottery. On the other side we discovered a portico made from unhewn stone and adopting the profile of a huge weave. This was the most extreme example of walking through a tunnel and it feeling like an earthy natural structure when in fact it came from the genius of Gaudí. In many ways the whole place felt like an Escher-esque illusion. In the remaining hours we decided to revisit some of our favourite places from our time in Barcelona. 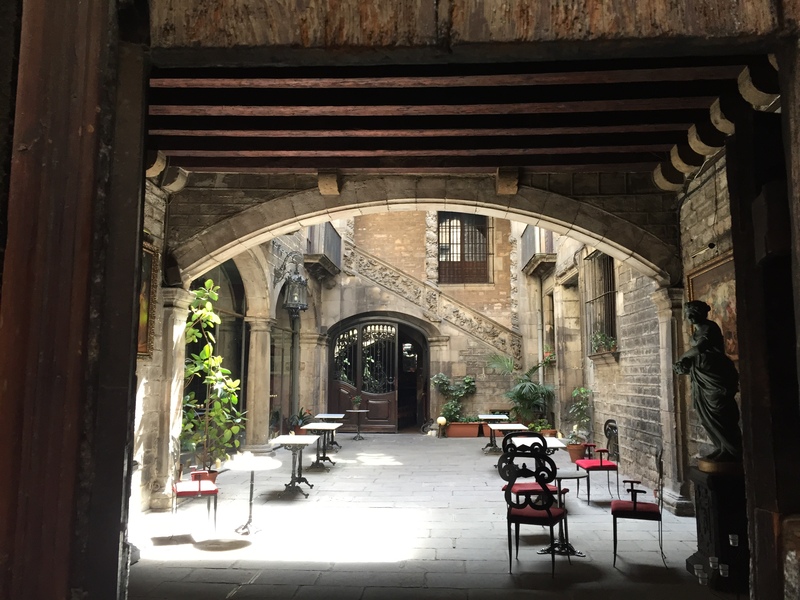 We took the Metro back to Las Ramblas and the market, where we had more delicious fruit drinks before strolling through the ever-atmospheric Barri Gothic quarter back to Plaza Reial where we had coffee, delectable feta peppers for lunch and watched the world go by. 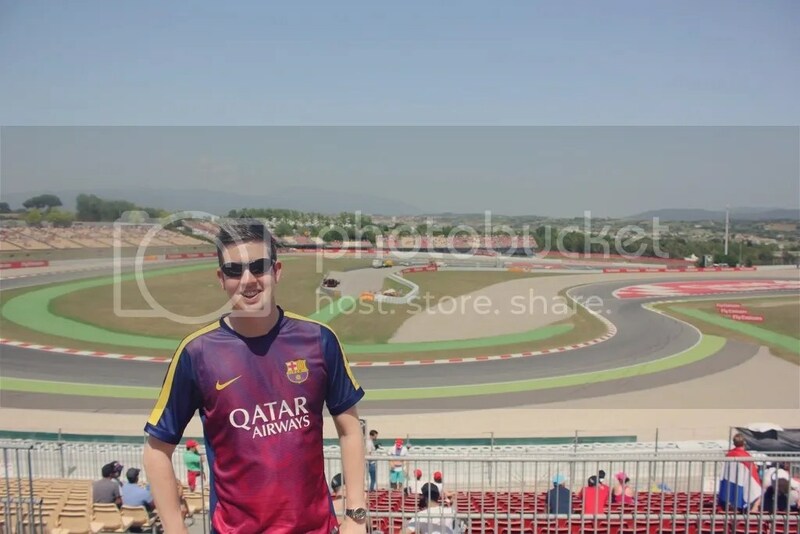 A member of a departing stag party gave his football to the excited children of the family opposite, in an instant summing up the spirit of laid-back inclusivity I had grown to love about Barcelona. Whenever I am stressed now I think back to that afternoon sat in Plaza Reial, watching the street performers, admiring the architecture and pondering on the fascinating history the walls around me had witnessed. We found the pen shop on the corner of Calle del Call and Calle Frenería from Carlos Ruiz Zafón’s The Shadow of the Wind whilst rambling through more alleyways in the Gothic quarter (I do believe you could get lost in those lanes for a lifetime and still find new treasures at the end of it). Then, after a last jaunt to the dazzling azure sea at the port, we took the metro back to our apartment one last time and left our new favourite city in the world. Having read Dan Brown’s Angels and Demons just before visiting Rome nine years ago, The Da Vinci Code before visiting Paris and doing a Da Vinci Code tour there the same year, Bill Bryson’s Down Under before visiting Australia for a year in 2012/13 and The Shadow of the Wind just before visiting Barcelona, I am going to make it my mission to read a book set in a city before I visit it. No amount of tour guides can help you get under the skin of a city and in touch with its history like a good novel can. I arrived in Barcelona already full of thoughts about the place and was itching to explore locations from the book, enthused by the world I had read about. 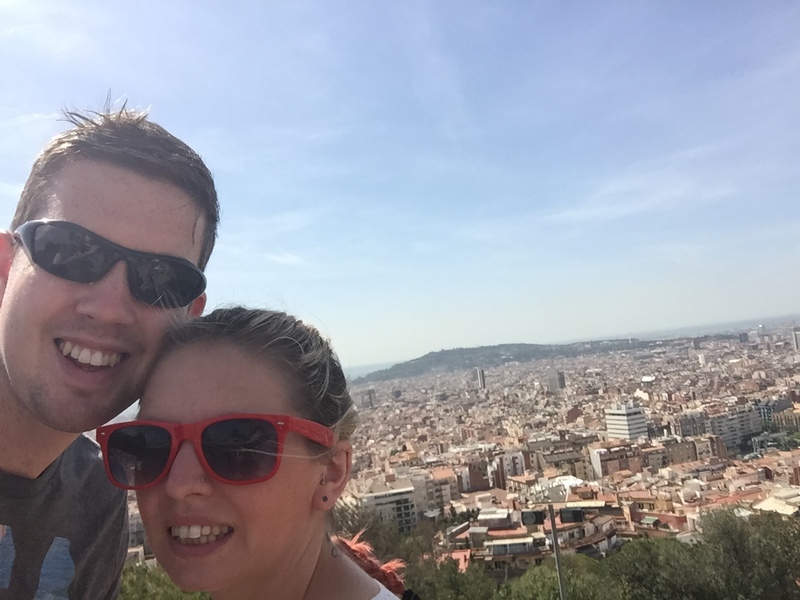 I could not recommend a visit to Barcelona more – it is truly everything one could want from a European city. It has marvellous architecture, great weather, stunning hills and viewpoints, a rich history and left me absolutely captivated. 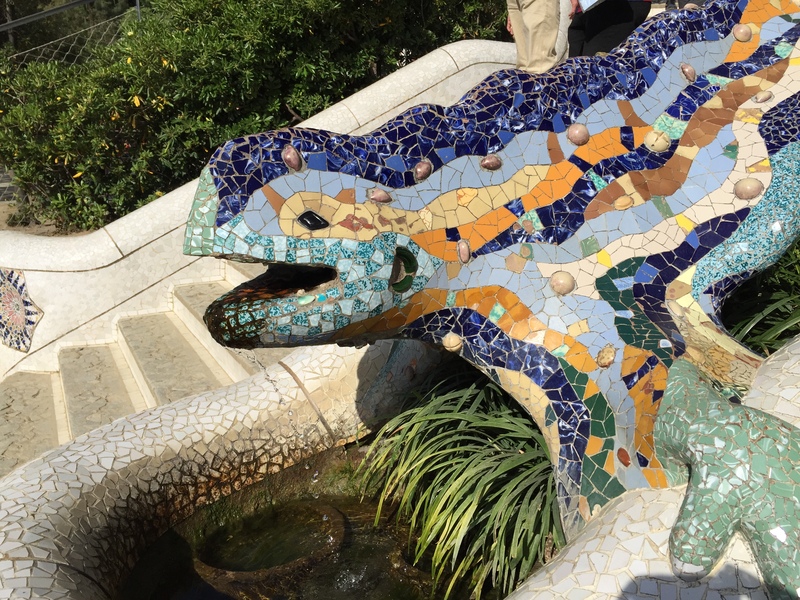 This entry was posted in Europe, Travel, Travel Videos and tagged Barcelona, Catalunya, Gaudi, Parc Guell, Spain. Bookmark the permalink.